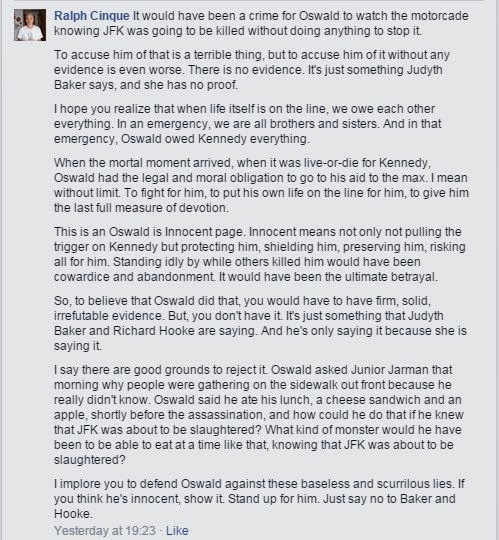 Oswald in the Doorway (not) : the blog of the Oswald Innocence Campaign,debunked by Lance Uppercut: Idiot Meltdown II - The Wrath of Judyth UPDATED! 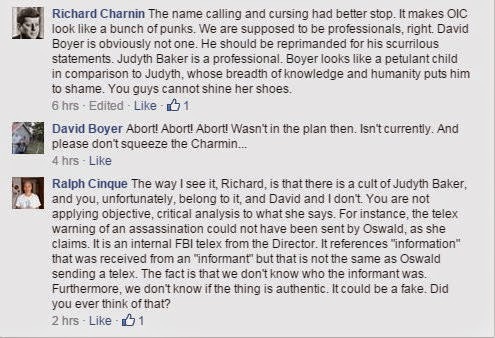 Idiot Meltdown II - The Wrath of Judyth UPDATED! 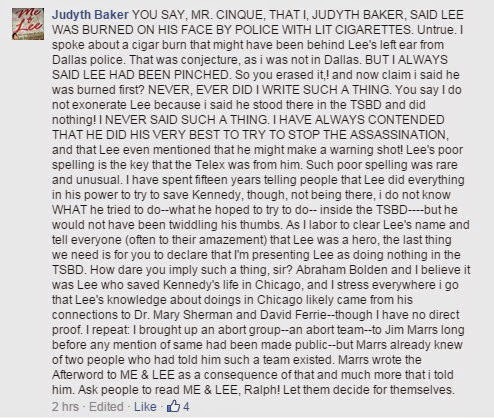 Ralph Cinque never wanted Judyth Baker as an O.I.C member - he has long been critical of her story and went as far as to say she would never be admitted as long as he had anything to do with it. 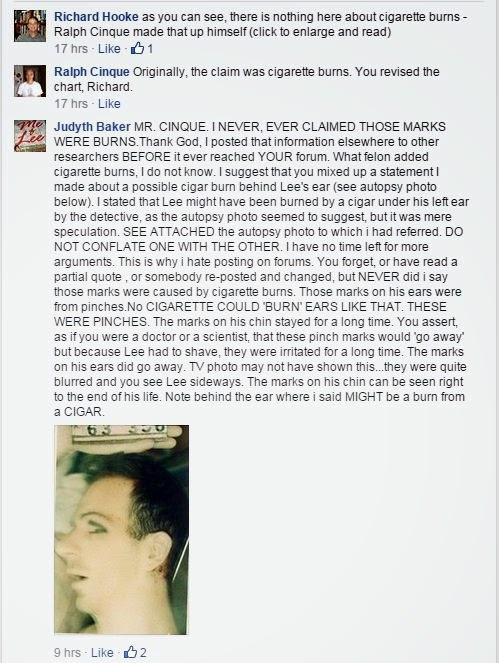 Actually Ralph, that's not a bad idea - you probably should consider asking people to read Judyth's epic "Me & Lee". Hell, you might even want to consider reading it yourself. I did, but then I've always been a sucker for romantic fiction. Ouch! "You assert, AS IF YOU WERE A DOCTOR OR A SCIENTIST...."! 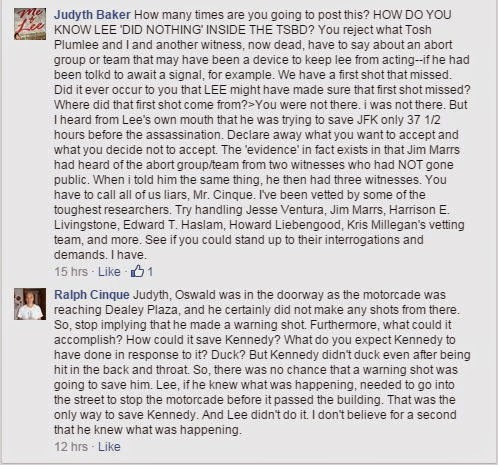 Now we of course know that Ralph is neither despite his claims to the contrary, but this is the first time he's been called on it by one of his own senior members. 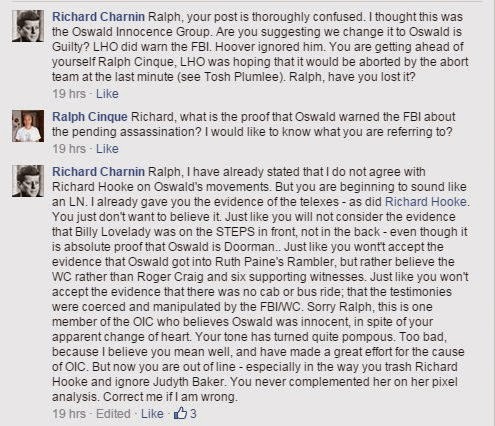 So two senior members of the Oswald Innocence Campaign are openly calling founder Ralph Cinque a liar and plagiarist. I wonder if anyone else has something to say? Ralph's dilemma is of course the logical consequence of assembling a group of individuals who are prepared to believe without question in any theory presented to them, no matter how wild and unsupported it may be. 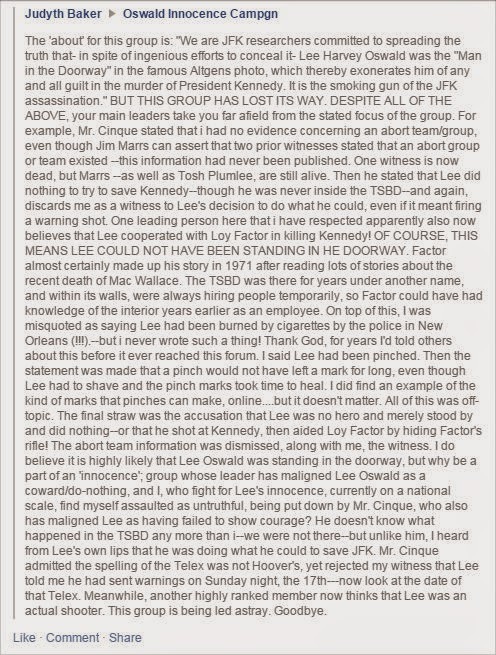 It's the ego - driven rantings of the lunatic fringe of JFK research that are so loved by the supporters of the official story, simply because they obscure rather than further the search for truth. Of course, that may be the very reason for their existence. 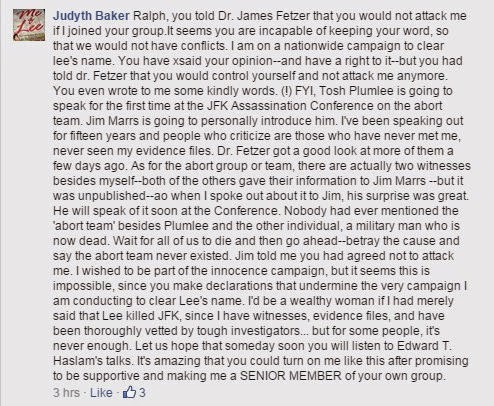 To make things worse Ralph is of course keenly aware that Judyth Baker has never placed Oswald in the doorway, despite his weak protestations that she has endorsed the idea in signing the OIC membership statement. As far as Judyth is concerned Ralph, much like Neville Chamberlain, merely holds in his hand a piece of paper. At this point Ralph, whose position in the OIC would you say was the most untenable? Yes, Judyth……. I'd be leaving that terrible group, too. Those bad old people, always twisting the truth. How can you sell any books that way? "Hey, Ralph……. get ova' heah an' shine my fukkin' shoes, muthafukka !!!"